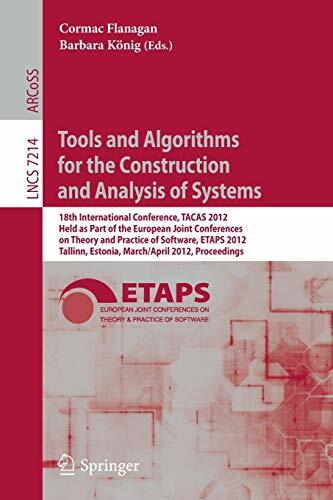 This book constitutes the proceedings of the 18th International Conference on Tools and Algorithms for the Construction and Analysis of Systems, T.A.C.A.S. 2012, held as part of the joint European Conference on Theory and Practice of Software, E.T.A.P.S. 2012, which took place in Tallinn, Estonia, in March/April 2012. The 25 research papers, 2 case study papers, 3 regular tool papers, and 6 tool demonstrations papers presented in this book were carefully reviewed and selected from a total of 147 submissions. The papers are organized in topical sections named: S.A.T. and S.M.T. based methods; automata; model checking; case studies; memory models and termination; internet protocol verification; stochastic model checking; synthesis; provers and analysis techniques; tool demonstrations; and competition on software verification.